This "paddleball" is a bit of a mystery. 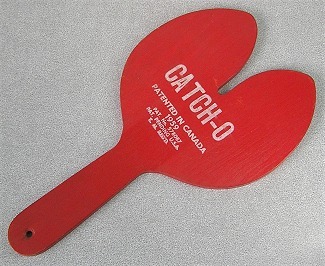 It was in with the paddleball paddles from the collection of Barney Ryan, Cheerio demonstrator. So this may be a Cheerio item. It also may be some sort of paddleball/hybrid toy. If you know more about this toy, please e-mail curator@yoyomuseum.com with more details. The paddle has a simple stamp for a logo, and is thinner than the standard paddles of the day. Only 1/4" thick.